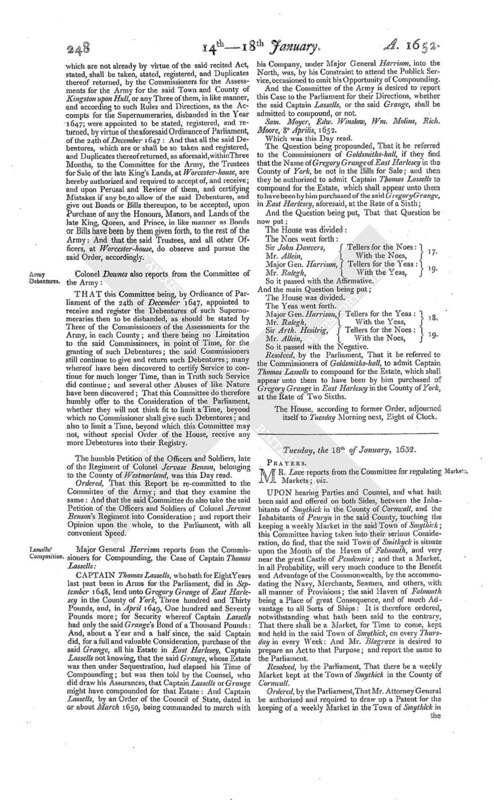 Journal of the House of Commons: Volume 7, 1651-1660. Originally published by His Majesty's Stationery Office, London, 1802. Friday, the 14th of January, 1652. SIR Henry Mildmay reports from the Council of State, a Letter, in English, to be sent to the Grand Duke of Tuscany: Which was this Day read. Resolved, That the Word "Resolution" be put, in the stead of the Word "Deliberation," in this Letter. Ordered, That some Members of the Parliament do withdraw, and see that the Letter be made to agree with this Draught; and that then the Speaker do sign the same, and seal it with the Seal of the Parliament; viz. Mr. Thomas Challoner, Mr. Scott, Col. Marten, Sir Henry Mildmay, or any Two of them. Ordered, That the Bill touching the Publick Faith, be reported on Tuesday Morning next, the first Business. IN pursuance of an Order of Parliament, of the 22th of September 1652, referring to this Committee the Report of September the First 1652, concerning the Satisfaction of the Cheshire Gentlemens Engagements for the several Sums of Seven hundred Fifty-one Pounds and One Shilling, and of Two thousand One hundred Fortyfive Pounds Eighteen Shillings and Four-pence, directing that Fifteen hundred Pounds thereof be charged upon the Treasury of Delinquents Estates; and the Residue, being One thousand Three hundred Ninety-six Pounds Nineteen Shilings and Four-pence, together with Interest, and Charges of Suits in Law since the making of the Report 16 Julii 1652, to be charged upon such Lands in Ireland as the Petitioners shall make Choice of: And the same to be set out, by the Commissioners of the Parliament for managing the Affairs in Ireland, in as large and ample Proportion, and with as large Privileges, as was to be allowed to any Adventurer or Adventurers, by any Act of Parliament in 1641, or 1642, or by an Ordinance of Parliament made the 14th of July 1643; and that, in the mean time, till they be possessed of the said Lands, they may be allowed out of the Lands in Ireland, Consideration for the Interest of the said Thirteen hundred Ninetysix Pounds Nineteen Shillings and Four-pence, and of the said Fifteen hundred Pounds; as also of what unavoidable Charge in Suits of Law shall be incurred before Satisfaction as aforesaid; and that the said Commissioners do settle them, or their Assigns, in the quiet and peaceable Possession thereof, accordingly. Upon serious Consideration of the Premises, and of the present urgent Occasions of the Parliament to make use of what present Monies comes into their Treasuries, this Committee do humbly offer it rather to be their Opinion, that the whole Sum of Two thousand Eight hundred Ninety-six Pounds Nineteen Shillings and Fourpence, be charged upon Irish Lands, such as the said Petitioners shall make Choice of; and that in as large and ample Manner and Proportion, and with as large Privileges, as was to be allowed to any Adventurer or Adventurers, by any Act of Parliament in 1641, or 1642, or by an Ordinance of Parliament made the 14th of July 1643; and that, in the mean time, till they be possessed of the said Lands, they may be allowed, out of Lands in Ireland, Consideration for the Interest of the said Sum, Two thousand Eight hundred Ninety-six Pounds Nineteen Shillings and Four-pence; since the Report made July the 16th 1652; as also Allowance for what unavoidable Charges in Suits of Law shall be incurred before Satisfaction be made and performed, as aforesaid: And that the said Commissioners do settle them, or their Assigns, in the quiet and peaceable Possession thereof; and to that Purpose, That there be a Letter written to the aforesaid Commissioners, by the Speaker of the Parliament, for the speedy and effectual setting-out and possessing them of the said Lands, accordingly. 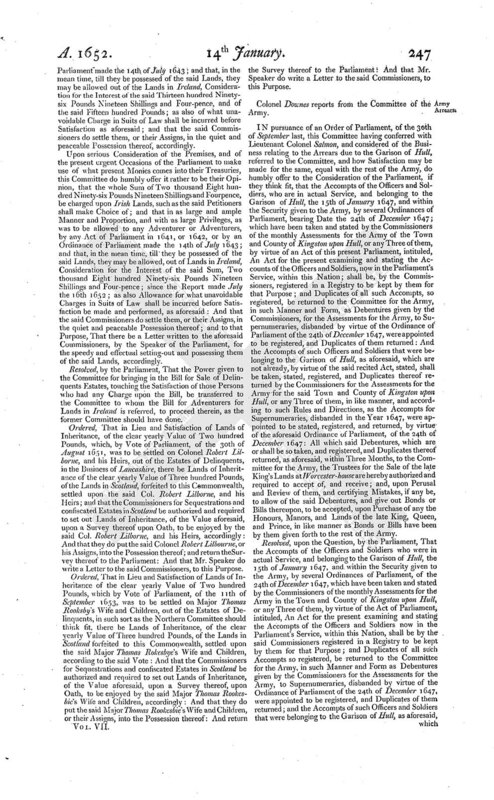 Resolved, by the Parliament, That the Power given to the Committee for bringing in the Bill for Sale of Delinquents Estates, touching the Satisfaction of those Persons who had any Charge upon the Bill, be transferred to the Committee to whom the Bill for Adventurers for Lands in Ireland is referred, to proceed therein, as the former Committee should have done. Ordered, That in Lieu and Satisfaction of Lands of Inheritance, of the clear yearly Value of Two hundred Pounds, which, by Vote of Parliament, of the 30th of August 1651, was to be settled on Colonel Robert Lilborne, and his Heirs, out of the Estates of Delinquents, in the Business of Lancashire, there be Lands of Inheritance of the clear yearly Value of Three hundred Pounds, of the Lands in Scotland, forfeited to this Commonwealth, settled upon the said Col. Robert Lilborne, and his Heirs; and that the Commissioners for Sequestrations and confiscated Estates in Scotland be authorized and required to set out Lands of Inheritance, of the Value aforesaid, upon a Survey thereof upon Oath, to be enjoyed by the said Col. Robert Lilborne, and his Heirs, accordingly: And that they do put the said Colonel Robert Lilbourne, or his Assigns, into the Possession thereof; and return the Survey thereof to the Parliament: And that Mr. Speaker do write a Letter to the said Commissioners, to this Purpose. Ordered, That in Lieu and Satisfaction of Lands of Inheritance of the clear yearly Value of Two hundred Pounds, which by Vote of Parliament, of the 11th of September 1653, was to be settled on Major Thomas Rooksby's Wife and Children, out of the Estates of Delinquents, in such sort as the Northern Committee should think fit, there be Lands of Inheritance, of the clear yearly Value of Three hundred Pounds, of the Lands in Scotland forfeited to this Commonwealth, settled upon the said Major Thomas Rokesbye's Wife and Children, according to the said Vote: And that the Commissioners for Sequestrations and confiscated Estates in Scotland be authorized and required to set out Lands of Inheritance, of the Value aforesaid, upon a Survey thereof, upon Oath, to be enjoyed by the said Major Thomas Rookesbie's Wife and Children, accordingly: And that they do put the said Major Thomas Rookesbie's Wife and Children, or their Assigns, into the Possession thereof: And return the Survey thereof to the Parliament: And that Mr. Speaker do write a Letter to the said Commissioners, to this Purpose. Colonel Downes reports from the Committee of the Army. IN pursuance of an Order of Parliament, of the 30th of September last, this Committee having conferred with Lieutenant Colonel Salmon, and considered of the Business relating to the Arrears due to the Garison of Hull, referred to the Committee, and how Satisfaction may be made for the same, equal with the rest of the Army, do humbly offer to the Consideration of the Parliament, if they think fit, that the Accompts of the Officers and Soldiers, who are in actual Service, and belonging to the Garison of Hull, the 15th of January 1647, and within the Security given to the Army, by several Ordinances of Parliament, bearing Date the 24th of December 1647; which have been taken and stated by the Commissioners of the monthly Assessments for the Army of the Town and County of Kingston upon Hull, or any Three of them, by virtue of an Act of this present Parliament, intituled, An Act for the present examining and stating the Accounts of the Officers and Soldiers, now in the Parliament's Service, within this Nation; shall be, by the Commissioners, registered in a Registry to be kept by them for that Purpose; and Duplicates of all such Accompts, so registered, be returned to the Committee for the Army, in such Manner and Form, as Debentures given by the Commissioners, for the Assessments for the Army, to Supernumeraries, disbanded by virtue of the Ordinance of Parliament of the 24th of December 1647, were appointed to be registered, and Duplicates of them returned: And the Accompts of such Officers and Soldiers that were belonging to the Garison of Hull, as aforesaid, which are not already, by virtue of the said recited Act, stated, shall be taken, stated, registered, and Duplicates thereof returned by the Commissioners for the Assessments for the Army for the said Town and County of Kingston upon Hull, or any Three of them, in like manner, and according to such Rules and Directions, as the Accompts for Supernumeraries, disbanded in the Year 1647, were appointed to be stated, registered, and returned, by virtue of the aforesaid Ordinance of Parliament, of the 24th of December 1647: All which said Debentures, which are or shall be so taken, and registered, and Duplicates thereof returned, as aforesaid, within Three Months, to the Committee for the Army, the Trustees for the Sale of the late King's Lands at Worcester-house are hereby authorized and required to accept of, and receive; and, upon Perusal and Review of them, and certifying Mistakes, if any be, to allow of the said Debentures, and give out Bonds or Bills thereupon, to be accepted, upon Purchase of any the Honours, Manors, and Lands of the late King, Queen, and Prince, in like manner as Bonds or Bills have been by them given forth to the rest of the Army. Resolved, upon the Question, by the Parliament, That the Accompts of the Officers and Soldiers who were in actual Service, and belonging to the Garison of Hull, the 15th of January 1647, and within the Security given to the Army, by several Ordinances of Parliament, of the 24th of December 1647, which have been taken and stated by the Commissioners of the monthly Assessments for the Army in the Town and County of Kingston upon Hull, or any Three of them, by virtue of the Act of Parliament, intituled, An Act for the present examining and stating the Accompts of the Officers and Soldiers now in the Parliament's Service, within this Nation, shall be by the said Commissioners registered in a Registry to be kept by them for that Purpose; and Duplicates of all such Accompts so registered, be returned to the Committee for the Army, in such Manner and Form as Debentures given by the Commissioners for the Assessments for the Army, to Supernumeraries, disbanded by virtue of the Ordinance of Parliament of the 24th of December 1647, were appointed to be registered, and Duplicates of them returned; and the Accompts of such Officers and Soldiers that were belonging to the Garison of Hull, as aforesaid, which are not already by virtue of the said recited Act, stated, shall be taken, stated, registered, and Duplicates thereof returned, by the Commissioners for the Assessments for the Army for the said Town and County of Kingston upon Hull, or any Three of them, in like manner, and according to such Rules and Directions, as the Accompts for the Supernumeraries, disbanded in the Year 1647; were appointed to be stated, registered, and returned, by virtue of the aforesaid Ordinance of Parliament, of the 24th of December 1647: And that all the said Debentures, which are or shall be so taken and registered, and Duplicates thereof returned, as aforesaid, within Three Months, to the Committee for the Army, the Trustees for Sale of the late King's Lands, at Worcester-house, are hereby authorized and required to accept of, and receive; and upon Perusal and Review of them, and certifying Mistakes if any be, to allow of the said Debentures, and give out Bonds or Bills thereupon, to be accepted, upon Purchase of any the Honours, Manors, and Lands of the late King, Queen, and Prince, in like manner as Bonds or Bills have been by them given forth, to the rest of the Army: And that the said Trustees, and all other Officers, at Worcester-house, do observe and pursue the said Order, accordingly. 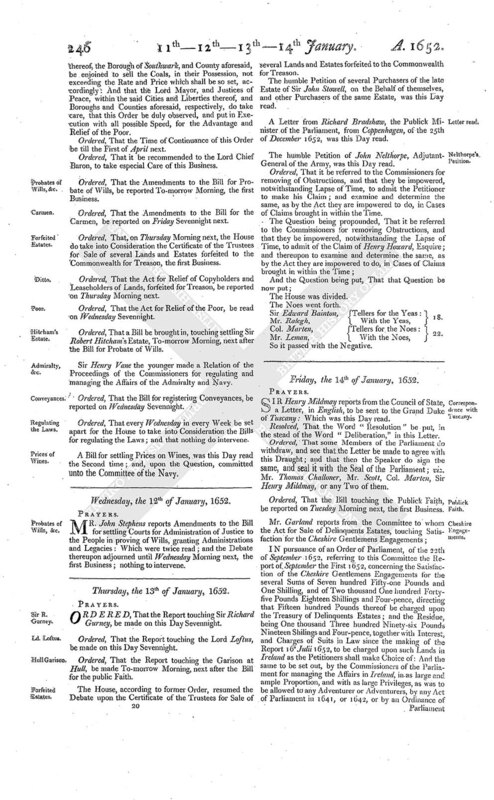 THAT this Committee being, by Ordinance of Parliament of the 24th of December 1647, appointed to receive and register the Debentures of such Supernumeraries then to be disbanded, as should be stated by Three of the Commissioners of the Assessments for the Army, in each County; and there being no Limitation to the said Commissioners, in point of Time, for the granting of such Debentures; the said Commissioners still continue to give and return such Debentures; many whereof have been discovered to certify Service to continue for much longer Time, than in Truth such Service did continue; and several other Abuses of like Nature have been discovered; That this Committee do therefore humbly offer to the Consideration of the Parliament, whether they will not think fit to limit a Time, beyond which no Commissioner shall give such Debentures; and also to limit a Time, beyond which this Committee may not, without special Order of the House, receive any more Debentures into their Registry. The humble Petition of the Officers and Soldiers, late of the Regiment of Colonel Jervase Benson, belonging to the County of Westmorland, was this Day read. Ordered, That this Report be re-committed to the Committee of the Army; and that they examine the same: And that the said Committee do also take the said Petition of the Officers and Soldiers of Colonel Jervase Benson's Regiment into Consideration; and report their Opinion upon the whole, to the Parliament, with all convenient Speed. CAPTAIN Thomas Lassells, who hath for Eight Years last past been in Arms for the Parliament, did in September 1648, lend unto Gregory Grange of East Harlesey in the County of York, Three hundred and Thirty Pounds, and, in April 1649, One hundred and Seventy Pounds more; for Security whereof Captain Lassells had only the said Grange's Bond of a Thousand Pounds: And, about a Year and a half since, the said Captain did, for a full and valuable Consideration, purchase of the said Grange, all his Estate in East Harlesey, Captain Lassells not knowing, that the said Grange, whose Estate was then under Sequestration, had elapsed his Time of Compounding; but was then told by the Counsel, who did draw his Assurances, that Captain Lassells or Grange might have compounded for that Estate: And Captain Lassells, by an Order of the Council of State, dated in or about March 1650, being commanded to march with his Company, under Major General Harrison, into the North, was, by his Constraint to attend the Publick Service, occasioned to omit his Opportunity of Compounding. And the Committee of the Army is desired to report this Case to the Parliament for their Directions, whether the said Captain Lassells, or the said Grange, shall be admitted to compound, or not. Sam. Moyer, Edw. Winslow, Wm. Molins, Rich. Moore, 8 Aprilis, 1652. Which was this Day read. Sir John Danvers, Tellers for the Noes: 17. Major Gen. Harrison, Tellers for the Yeas: 19. So it passed with the Affirmative. Major Gen. Harrison, Tellers for the Yeas: 18. Sir Arth. Hesilrig, Tellers for the Noes: 19. So it passed with the Negative. Resolved, by the Parliament, That it be referred to the Commissioners of Goldsmiths-hall, to admit Captain Thomas Lassells to compound for the Estate, which shall appear unto them to have been by him purchased of Gregory Grange in East Harlesey in the County of York, at the Rate of Two Sixths. The House, according to former Order, adjourned itself to Tuesday Morning next, Eight of Clock.